At VAG Auto Care Services we pride ourselves on top quality service for the customer and pocket pleasing prices. We offer a range of service types, from routine oil and filter changes to full inspection services which comprise of oil and filter change, brake fluid change, air filter change or clean, fuel filters changed and electronic diagnostic checks via VCDS. At VAG Auto Care Services our full service includes, oil and filter, air filter, fuel filter, cabin filter where fitted, full visual check of components and a full diagnostic check of the vehicle's electronic systems with a service reminder reset. An Oil and filter change is a yearly service.this includes a visual inspection of the cars components. Lots of people like to change the oil every 6 months / 5k miles, this is an ideal service between service intervals and helps to significantly reduce wear on your engine. We can change your brake and clutch fluid (if the car has a hydraulic clutch) with vehicle specific brake fluid. We replace cambelts on all engines including 4 cylinder engines such as the 20V 1.8 Turbo models, the 1.9TDI injection pump and PD Models, the 2.0TDI and 1.6TDI and many more. We have built up a solid reputation all over the UK for our work in maintaining the Volkswagen 3.2 VR6 engine, in all it's forms, mounted in Golf MK4 / MK5 R32 models, Audi A3 / TT MK1 / Mk2 models, Passats and Touaregs. 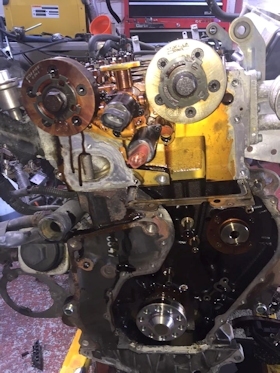 These vehicles run a cam chain which slowly stretches over the vehicle's life and has to be changed, to maintiain the vehicles optimum perfornance. 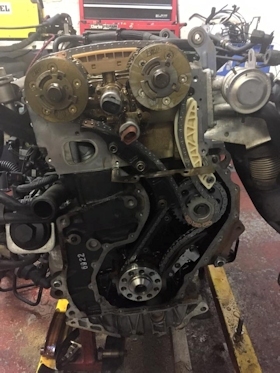 It is important to keep on top of the servicing for cam belt / cam chains, if a cam belt / chain snaps it can cause severe damage which usually results in needing to replace the engine. We can perform diagnostics on the 3.2 VR6 engine to verify the stretch condition of your cam chain and discuss it's replacement if required. 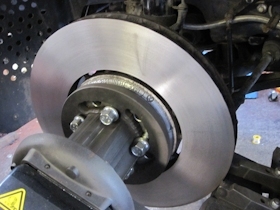 We have a PRO CUT disk skimming lathe to skim brake discs, to create a flush inner and outer brake disc surface and solve brake vibration problems . Some people consider that brake disc skimming is an old-fashioned practice that went out 20 years ago. Not true. Today's on-car brake lathe technology, where Pro-Cut is the world leader, enables discs to be skimmed quickly, efficiently and with amazing accuracy. 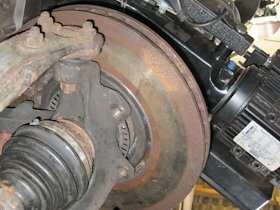 Brake pads are changed but new discs are not necessary, which happens in at least 50% of brake servicing. There is no bedding in, and your car has perfect brakes as you leave the workshop. Brakes are noisy. When new pads are fitted to lipped discs, brake squeal can result. This can be corrected by skimming the discs to remove lips and give perfectly flat disc surfaces. We have a VAMAG Vector 4wheel camera alignment kit. This uses Haweka Pro-Clamps that give precise readings with no need for rolling runout, these also fit on cars that are very low, most clamps sit on top of the tyre meaning a good arch gap is needed to fit the clamps.